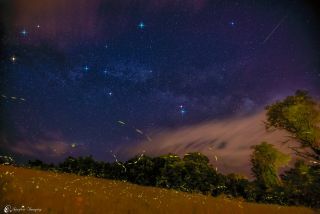 This image of fireflies under the Milky Way was taken by Matt Pollock from his backyard on June 7, 2013 in his backyard in the Town of Brunswick, New York. Flickering fireflies appear to create lines of light in a field beneath the Milky Way in this spellbinding long-exposure view by an astrophotographer. The image was captured by Matt Pollock on June 7, 2013 in his backyard in Brunswick, New York. Pollock sent the photo in to Space.com this month, adding that it harkens back to a childhood memory. Pollock's childhood memory of fireflies stayed with him and with careful planning, he was able to capture the bright bugs in this stunning image. The image was blended into a composite to avoid creating long star trails and to highlight the so-called "Summer Triangle" star pattern of the Milky Way including the dark rift. The Summer Triangle is made up of three bright stars from three separate constellations. Vega in Lyra, Altair in Aquila and Deneb in Cygnus.